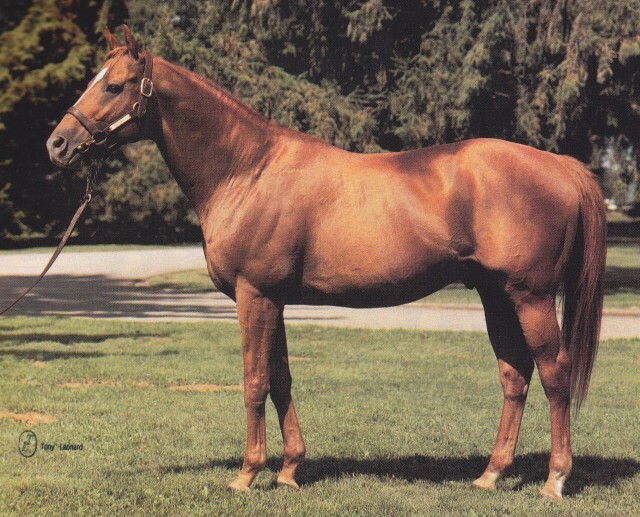 Affirmed was a beautiful golden chestnut by Exclusive Native – Won’t Tell You by Crafty Admiral. His pedigree is full of top class horses as we can see Mahmoud, Sir Gallahad III, War Admiral, Equipoise and Polynesian in his fourth generation alone. He is a direct male line grandson of Raise A Native. Bred in Florida by Louis E. Wolfson under the banner of his Harbor View Farm, Affirmed raced in the flamingo pink, white bars on black sleeves, black cap colors of Harbor View. Laz Barrera was his trainer, while a very young Steve Cauthen was his most frequent jockey throughout his career. Little did Affirmed and his connections know as he was training for his first races that he was destined to be part of one of the greatest rivalries ever witnessed in racing history. Affirmed and Alydar would be forever linked together. Their on track rivalry created stirring headlines. Later as highly sought sires, fans would compare them as rivals. They were both from the same sire line as Alydar was a son of Raise A Native. Both colts were chestnuts, although Alydar was a deeper red color. Alydar possessed a more muscular build while Affirmed was the epitome of the sleek agile Thoroughbred. When they were juveniles, these two would meet six times on the tracks throughout the US. Their first meeting came in the Youthful Stakes at Belmont on June 15, 1977. Affirmed won the race, his first Stakes victory after he broke his maiden at first asking, while Alydar making his first ever start in this race finishing fifth. They met again three weeks later, also at Belmont in the Great American Stakes. Alydar won this one by three and one half lengths. Both of these races were five and a half furlong events. Affirmed then captured the Juvenile Championship Stakes at Hollywood Park and the Sanford Stakes at Saratoga. The latter race being the first for Steve Cauthen in the irons. On August 27 at Saratoga the rivalry would renew in the grade one Hopeful Stakes. Affirmed won this race by half a length and then two weeks later, round four between these two came in the Futurity Stakes at Belmont with Affirmed capturing this race by a nose. By now the Affirmed vs Alydar scenario was big news throughout the racing world. On October 15 again at Belmont, Alydar exacted some revenge and won the one mile grade one Champagne Stakes by one and a quarter lengths. The final race for the 1977 season between the two came two weeks later in the grade one Laurel Futurity. Affirmed prevailed by a neck following a long and stirring stretch drive between the two. The score now for the season was; Affirmed 4 Alydar 2. Affirmed would be named the Eclipse Champion Two Year Old. The two went their separate ways while they prepared for the highly anticipated showdown in the upcoming Kentucky Derby. Affirmed to California and train and race there. Alydar stayed in the east. The reigning juvenile champion made his three year old seasonal bow in a six and a half furlong allowance race at Santa Anita, winning by five lengths. Ten days later he won the nine and one half furlongs grade two San Felipe Stakes by two lengths. In his third start in 1978 Affirmed blew away the field in the Santa Anita Derby by eight lengths. Laffit Pincay Jr. deputised for Cauthen while the latter recouped from a minor injury. The final tune up race before the Kentucky Derby came in the Hollywood Derby. Affirmed won comfortably by two lengths, satisfying Laz Barrera that his charge was ready to tackle his adversary. Alydar on the other hand had swept the Flamingo Stakes, the Florida Derby and the Blue Grass Stakes (by thirteen lengths!) in his preps. The 1978 Kentucky Derby was one of the most highly anticipated classic races in history. The big rivalry was to be renewed and both main opponents were coming into the race in top form. The large crowds that gathered in the saddling ring before the race emitted an air of anticipation and excitement that surely must have been felt by the horses themselves. The press was reporting every little nugget of information regarding the two main entrants. Affirmed or Alydar. Alydar or Affirmed. Take your pick. Race fans were to decide that Alydar would be the likely winner and made him the favourite at 6/5. Affirmed was second choice at 9/5. The big race became somewhat anticlimactic as Alydar would have trouble getting a hold of the track. Affirmed stalked the pace and then made his move around the far turn. He duelled with Believe It until the final furlong, pulling away to win the race by one and one half lengths. Alydar had finally found his stride by mid stretch, but was left with too much to do. He could not catch Affirmed, finishing second to his rival. Apart for their first meeting, this was the biggest margin of victory Affirmed would ever have against Alydar. The Preakness Stakes two weeks later became round eight in this compelling rivalry. This time Affirmed was favoured. Affirmed broke from the gate sharply and hounded the early pace setter Track Reward until midway through the first turn when he took the lead. At the top of the far turn, Affirmed began to lengthen his stride while Alydar, who had been steadily moving up from the back, started to put his big run in. At the top of the stretch, Affirmed had full control but Alydar was not giving up as he swept around Believe It and went after Affirmed. He could not get past however as Affirmed would dig in and deny his rival, winning by a neck, displaying enormous courage in victory. Affirmed now had the Triple Crown in sight. Could there be another winner of this elusive feat and in back to back years? The turf writers were having a field day and were not short of interesting story lines for the upcoming Belmont Stakes. Along with the possibilities of Affirmed’s chances to follow Seattle Slew, Secretariat and the other eight champions of the Triple Crown, there was still the ongoing rivalry between Affirmed and Alydar. The Belmont Stakes was shaping up to be a match race between them. The 1973 Belmont between Secretariat and Sham had been billed as such. The sports world was riveted to this new rivalry. As with the 1973 Belmont, only three other horses were to enter into the race to face the big two combatants. However this edition of the classic one and a half miles mile race will be always remembered for the captivating head to head duel of Affirmed and Alydar. The race exceeded the pre-race build up. Affirmed was made the favourite. Both horses broke from the gate well with Affirmed taking the lead from Judge Advocate into the first turn. Alydar settled in third along the rail. Alydar would swing around Judge Advocate to slot into second behind Affirmed who was slowing the pace, cutting a twenty-five second first quarter and a fifty second half mile. Midway down the back stretch Alydar moved to Affirmed who would immediately increase his speed to keep his rival from gaining an advantage. The two locked together and increased the margin from the field. Now we have the match race that was anticipated as they accelerated together going into the far turn. Affirmed on the inside, Alydar on the outside, the stage is set for a riveting stretch run. They see sawed back and forth through the turn and hit the top of the stretch side by side. Alydar got his head in front midway through the stretch only to have Affirmed battle back. They were never any farther than a head apart. At the wire it was Affirmed who got his head in front to win the Belmont Stakes and consequently the Triple Crown. Everyone was exhausted. The horses, the jockeys, their connections and the fans were spent with emotion. There was jubilation for the Affirmed backers, and heartbreak for the Alydar supporters. With everything on the line, these two equine wonders had left it all on the track and the turf world was in awe from what had just transpired. It was a race for the ages. Affirmed took a well deserved two month break between races. He did not come back until the Jim Dandy Stakes at Saratoga in August. He won this race and then round ten of the big rivalry took place eleven days later in the historic Travers Stakes. Affirmed stalked the early pace setter until the back stretch when on the outside he gained the lead. Meanwhile Alydar moved up along the rail and started his challenge. As Affirmed was entering the far turn he veered across the onrushing Alydar and cut him off. Alydar would then have to check up and go wide, losing his momentum. Down the stretch Affirmed widened his lead with Alydar now back in stride but unable to catch him. Alydar was declared the winner however as the stewards would disqualify Affirmed for interfering with Alydar and placed Affirmed second. This was to be the last race these two would ever have together. Affirmed set his sights to face the previous year’s Triple Crown winner Seattle Slew one month later in the Marlboro Cup at Belmont. Affirmed was the new darling of the betters and was favoured in the first race to ever feature two Triple Crown winners. Seattle Slew won by three lengths. The final race for the season for Affirmed was another facing with Slew but as the two were locked in a speed duel, Cauthen’s saddle slipped and Affirmed dropped back losing by eighteen lengths to Exceller, who had defeated Seattle Slew. Despite losing to Seattle Slew, Affirmed was named the Eclipse Horse of the Year. His Triple Crown was just too much to ignore by the voters. Barrera brought Affirmed back to California for the winter to get him ready to run as a four year old. The first two starts for Affirmed were not winning races. He finished third to Little Reb and Radar Ahead in the Malibu Stakes. Two weeks later he ran second to Radar Ahead in the San Fernando Stakes, ahead of Little Reb. In the following two weeks Affirmed won the grade one Charles H. Strub Stakes by ten lengths, but not with Steve Cauthen in the saddle. Laffit Pincay Jr. had become his jockey. This partnership would last until Affirmed’s retirement from racing. The new pairing went undefeated for the rest of the year. Affirmed reeled off the Santa Anita Handicap, the Californian Stakes and the Hollywood Gold Cup (carrying 132 lbs). Each of these races are grade one events. Barerra gave Affirmed a little rest and brought the champion back east. In his return he won an allowance race that was a non wagering event as only three horses were entered. Affirmed’s final two races were the Woodward Stakes and the Jockey Club Gold Cup. In the first race he beat Coastal by two and one half lengths. In the JC Cup he defeated the new three year old star Spectacular Bid by three quarters of a length. Affirmed earned his second Eclipse Horse of the Year Award and retired as the all time leading money earner (at the time) with $2,887,999 in purse winnings having won. His final career totals being twenty-two race wins in twenty-nine starts. Affirmed was syndicated for stud duty for a then record $14.4 million. He began his career as a sire at Spendthrift Farm, move to Calumet alongside his arch rival Alydar and then to Jonabell Farm where he would remain until his death from laminitis on January 12, 2001. He had a wonderful career as a sire getting eighty-six stakes winners (10.2%), twelve of which were named champions. His daughters have become highly sought broodmares producing over one-hundred and fifty stakes winners, and counting. In an interesting turn of events Affirmed sired excellent grass runners, which since he had never started a race on grass was quite an astonishing revelation. Perhaps his best offspring was two time Champion grass mare Flawlessly. Bred and raced by Harbor View Farm, Flawlessly won the grade one race Matriarch Stakes and Ramona Handicap three times apiece, while also adding the Beverly D. Stakes, San Clemente Handicap, the Beverly Hills Handicap (twice). As a two year old Flawlessly took the Gardenia, Tempted Stakes and grade one Frizette Stakes. Another champion sired by Affirmed was the popular Canadian Triple Crown winner Peteski. A bright chestnut like his sire, Peteski was trained by Hall of Fame member Roger Attfield. After only one undistinguished start as a two year old, Peteski would break his maiden in his first start as a three year old by ten lengths. He continued his rapid improvement winning an allowance race by seven lengths and then another allowance race by four. Finishing in second place in the Plate Trial Stakes was bit of a setback but in the Queen’s Plate he romped to a six length victory. Peteski completed the Triple Crown with a four length win in the Prince of Wales Stakes and a thorough six length victory in the one and one half mile Breeder’s Stakes on the E. P. Taylor turf course at Woodbine. The new Canadian star then thrilled his fans with his big win in the grade one Molson Million. In the one and a quarter mile race for three year olds, Peteski defeated Sea Hero (Kentucky Derby and Travers Stakes), Colonial Affair (Belmont Stakes) and Kissin Kris (Haskell Stakes). There are more top performers sired by Affirmed such as The Tin Man (Arlington Million, Clement Hirsch Turf Championship twice, Shoemaker Mile). Zoman (Phoenix International, Prix d’Ispahan, Washington International). Affirmed Success (Carter Handicap, Vosburgh Stakes, Cigar Mile). Quiet Resolve (Canadian horse of the year, Woodbine Mile, King Edward Gold Cup). Charlie Barley (Summer Stakes, Dominion Day Stakes, Maker’s Mile Handicap). One From Heaven (Canadian champion three year old filly, Canadian Oaks, Selene Stakes). Pint Pasha (Champion three year old filly in France, Prix Vermeille, Yorkshire Oaks). Trusted Partner (Irish 1000 Guineas). As a sire of stakes producing broodmares, Affirmed has been exceptional. His daughters of have produced Balanchine (Epsom Oaks, Irish Derby), the successful but short lived sire Harlan’s Holiday (Florida Derby, Blue Grass Stakes, Donn Handicap), Pleasantly Perfect (Breeder’s Cup Classic, Dubai World Cup, Pacific Classic), Romanov (Jockey Club Stakes), Bernstein (Railway Stakes), and multi stakes winner Caress (dam of Sky Mesa). Clearly Affirmed was a very special horse. He was an easy soul to be around and was well loved by all who had the pleasure to be in contact with him. He won his Triple Crown the hard way, defeating a very capable and worthy opponent in Alydar who could have just as well been a Triple Crown winner himself. He became a very successful sire, even though the perception of many is that his get did not live up to the high standards of Affirmed’s own extraordinary racing achievements. He was a tough act to follow. Affirmed was a beautiful horse. The internet is full of wonderful pictures of him, which have been posted by many of his fans. Although Alydar was to have a more influential career at stud, Affirmed did very well in his own right. Such was the rivalry that even when retired, many compared the two as sires. Forever linked together. A champion in each of his three racing seasons. A sire of sublime quality and influence. A unanimous member of the National Museum of Racing Hall of Fame. In this writer’s opinion, Affirmed was one of the most beautiful champions to ever grace the track. We can only be lucky to see his kind again. One of my all time favourites. I wonder since his get were so good on grass if he might have been even better on grass had Berrera tried him. We will never know. Pincay said Affirmed was the greatest horse he’s ever ridden; that says a lot. A personal favourite. Well written article. Thanks.